« Crimson Peak makes the Best 25 Gothic Horror Novels List! 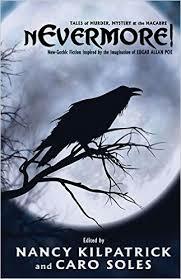 I’ll be signing nEvermore: New-Gothic Fiction Inspired by the Imagination of Edgar Allan Poe with editor Nancy Kilpatrick and fellow contributors Jason & Sunni Brock, Christopher Rice, Richard Christian Matheson, Lisa Morton, and William F. Nolan. Please come say hi at 3512 West Magnolia Blvd., Burbank, CA, 91505. This entry was posted on Sunday, November 29th, 2015 at 8:06 am. You can follow any responses to this entry through the RSS 2.0 feed. Both comments and pings are currently closed.